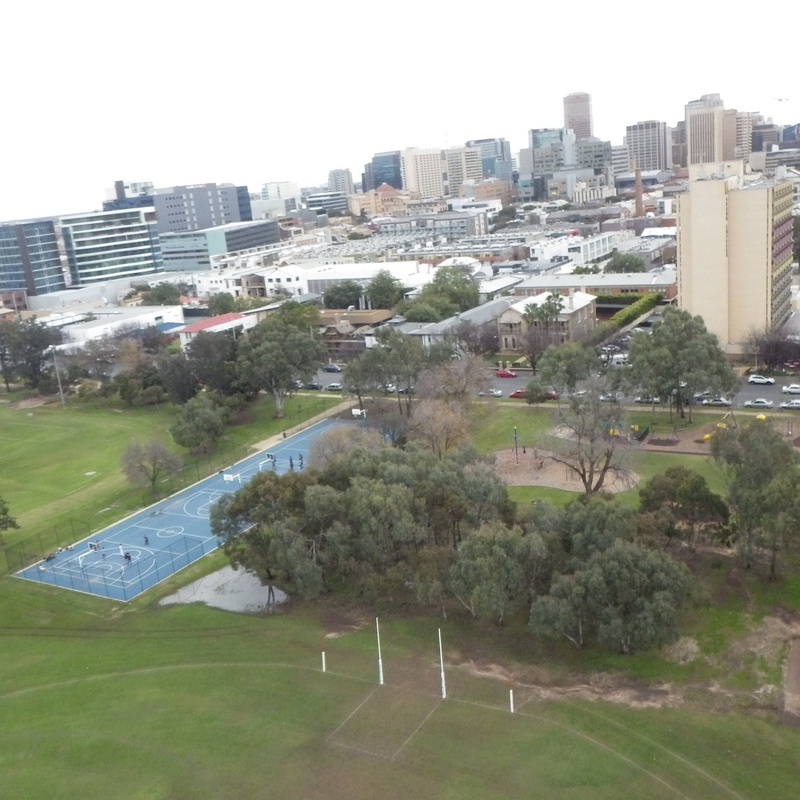 This was the second attempt to capture the Adelaide CBD from Karrangga Park in the southern parklands. On the first occasion, some weeks ago, a lack of wind foiled any KAP (Kite Aerial Photography). The big Multi-Dowel Sled did have a brief hop or three, but without the rig attached to the flying line. Today was very breezy, which made it necessary to use the Fresh Wind Barn Door kite. The movie near the bottom of this page captures the sound of 35kph gusts whistling past the camera and vibrating the flying line! The 20-pound Dacron full Picavet suspension line is proving more trouble than it is worth. Difficult to store and use in the field without tangles and twists causing frustration and loss of time. Rigs with thicker line and precision pulleys are the way to go it seems - as many KAPers use. Thin line and paper-clips for pulleys have proved quite OK in a Half Picavet arrangement. So I might do more of that for a while. Usually, a small but heavy chair is used like a tripod to get well-aligned images which the camera stitches into panoramas. Handy for giving a visual summary of the cloudscape. Sick of carrying the chair, I decided to try again with hand-held panoramas. Not one of the three came out well enough to publish here, so it's back to the trusty little chair I guess! There seemed to be a lot of mid-level cloud about, on a day which was supposed to be 'mostly sunny'. By the time the kite was up, the sky was practically overcast. Fortunately, the cover was not thick and so a reasonable amount of sunlight penetrated through to illuminate the CBD of Adelaide to the North. On the second flight, which took video, gaps were starting to appear in the cloud cover and there were short periods of good illumination for the camera. Up above 100 feet the Northerly wind was fairly smooth at first, although gusting into the mid-thirty's (kph). Later in the morning, the on-and-off sunlight started warming the ground and the air became more active. Rougher for the kite in other words! Straining away one minute and dropping towards the ground the next. All three of us were on the field today, warmly dressed against the sub-15 degree (C) temperatures. Lifter: The Fresh Wind Barn Door kite, which I plain forgot to photograph in flight today. It duly coped with the rather fresh wind strengths and moved slowly around the sky. Today I tried hitching on the two drogues for additional stability. More or less as expected, the extra drag was not the best thing for it, keeping the kite low more often and making it fight against the heavy air pressure. Perhaps the drogues are best left for the larger light-wind Multi-Dowel Barn Door. 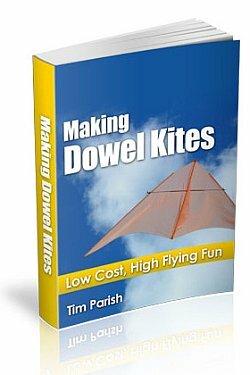 See my e-book at the top of this page, if you would like to make any of these large kites for yourself. KAP Rig: Bamboo skewer cage with a wad of folded paper wedged in behind the camera to incline the field of view down a little. Full Picavet suspension. Due to twists near one 'pulley', the suspension line didn't slip too well today - causing gross changes in the camera's direction at times. Camera: Pentax Optio WG-2 with built-in intervalometer. EV set to 0.0. The intention was to step down through several negative EV settings, but we ran out of time. ISO was on 800 to help reduce motion blur. Focus was fixed on infinity. 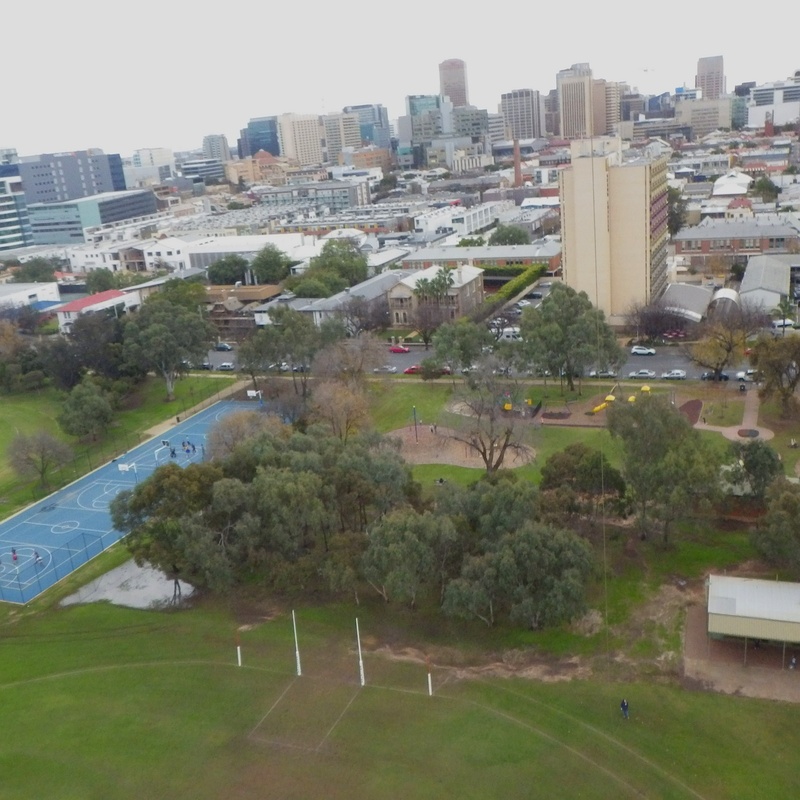 These five images are samples of what the city of Adelaide looks like from around 200 feet over South Terrace. One day I hope to achieve some better quality shots from here. 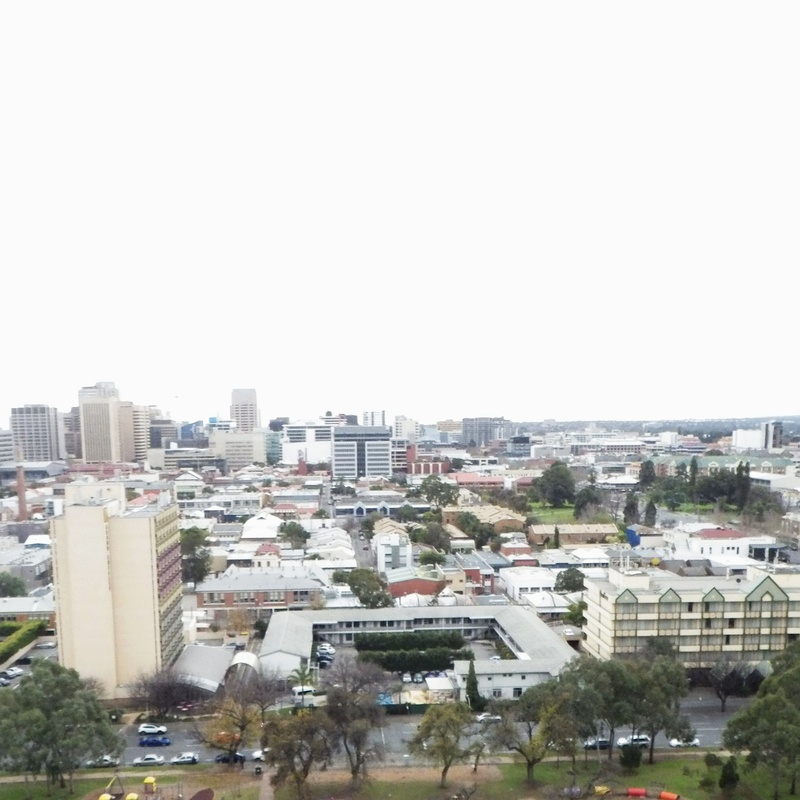 Adelaide CBD showing the main buildings along King William Street, almost to North Terrace. Looking down on where the kite was launched. Shows some traffic on South Terrace and your's truly holding the line. Looking directly North from South Terrace. Orginal image rotated to level the horizon. Unprocessed photo. 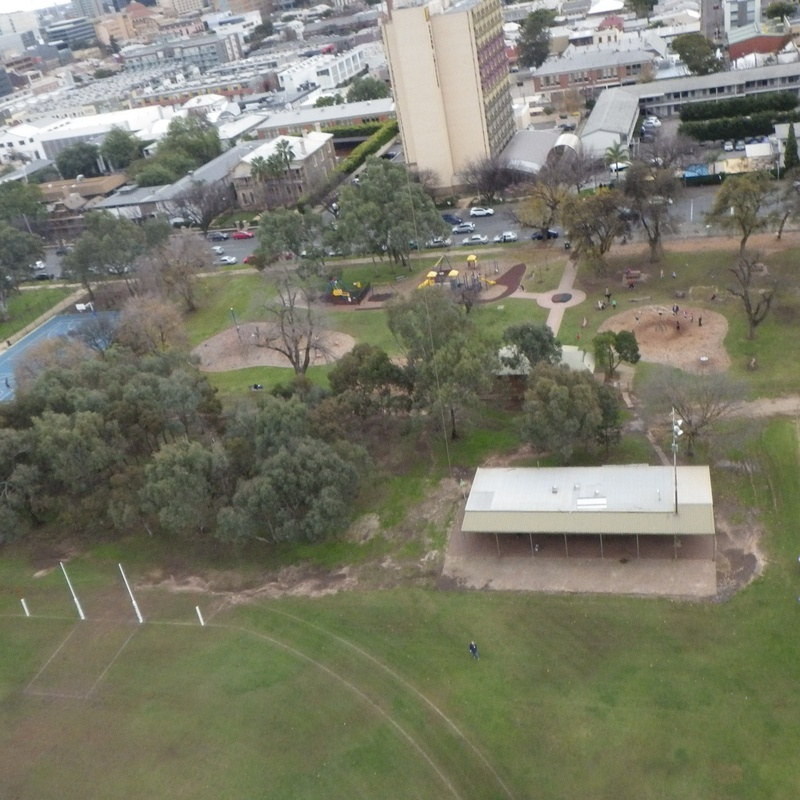 Another view of the major buildings, this time showing more of them up near North Terrace. 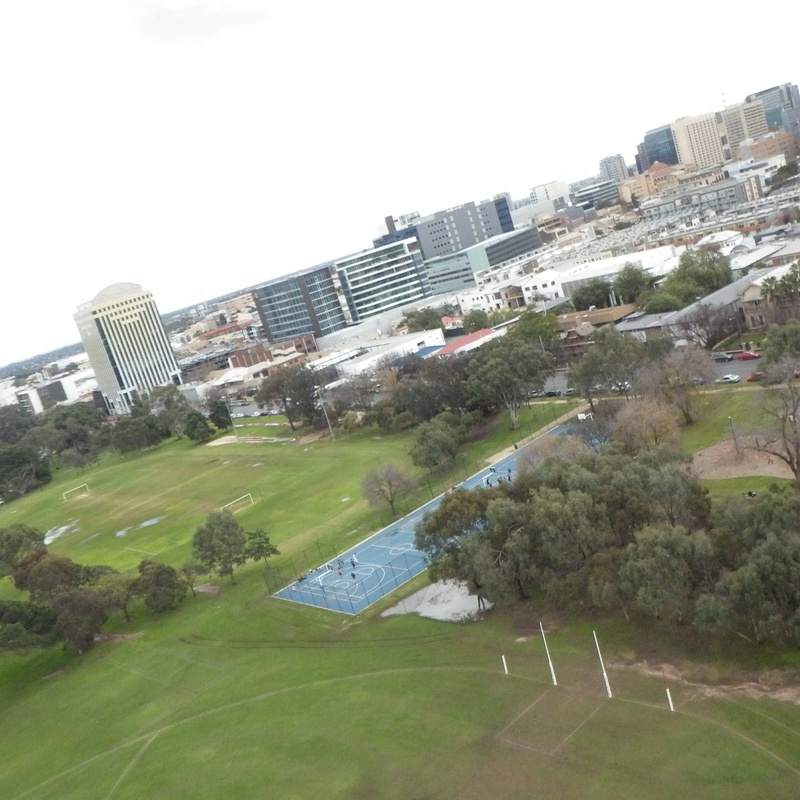 Most of the larger buildings near North end of CBD, at top of photo. Reduced brightness and boosted saturation in this shot. KAPing with the family has its pros and cons. Today's session got off to a late start after my wife needed the camera for a while. On the other hand, she did a great job sorting out a hopelessly tangled suspension line! On balance, I think I will continue to be the Lone KAPer. And continue to improve the equipment and methods to make the whole process as quick and easy as possible. The untangled Picavet line still had some twists near one of the slip-through points. It wasn't clear how this could be fixed quickly on the spot, so it was decided to just go ahead and hope for the best. There's a week or so of bad weather on the way! Moderate strength gusts were swirling across the damp grass near ground level, making for fairly easy launching of the big blue Barn Door kite. While it was still low, Aren (8) ran back and was able to separate the two drogue lines which had crossed over on the ground. The kite's movement left and right tended to be slow and steady. However, sudden changes in wind strength caused most of the KAP rig movement as the flying line tension went up and down. At last, there it was, an aerial camera pointing roughly in the right direction most of the time. Occasionally, a drop in wind strength would allow the kite to soar much higher, taking the camera over 200 feet off the grass. During a second flight with video being taken, the sun came out occasionally. About time! Far off to the West, a small flock of pelicans took advantage. They gracefully circled up in a small weak Winter thermal. After a few minutes had been spent with the kite at fairly high line angles, I put on some canvas gloves and walked the line down. The drogues, dragging away at the tail end of the kite, probably made this a bit quicker and smoother than usual. We packed up and headed off for lunch. With plenty of imagery 'in the can' as they say. Happily, some extra sunlight came out while the video was being taken. Stronger colors without having to fake it digitally!